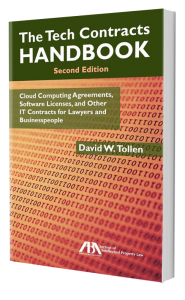 Tech Contracts Academy™ / Author's Corner / #1 New Release — Amazon “Cloud Computing”! Earlier this week, I reported that The Tech Contracts Handbook was Amazon’s #1 new release in the “Business Purchasing & Buying” category. Now it’s number one in the far larger, more general “Cloud Computing” category!